Laser printing and hand matching 3 personalised documents to 2,500 housing association tenants, mailing them out within 24 hours. Laser printing and mailing out a 14 month wall planner to 10,250 customers. The coordination and fulfilment of a new range of branded clothing to a field force of 35, with each person requesting variable sizing, colour and styles and personalised embroidery. Laser printing and mailing out quarterly rent statements and newsletters to 10,500 housing association tenants. Successful completion of a 4 month outgoing telemarketing plan to 1,150 business to business customer records to verify contact details and ascertain buying intentions over the next 12 months. This campaign generated 35 qualified sales leads, which ultimately contributed to 3 sales of high value capital equipment. Laser printing 6 different versions of a carrier sheets across 10 databases, with variable inserts to a total of 12,000 prospective customers for a travel company. Commencing the coordination and bulk distribution of 2013 calendars to multiple worldwide locations. This project involves complex customs documentation for numerous locations, and ensuring the deliveries are cost effective and timely! 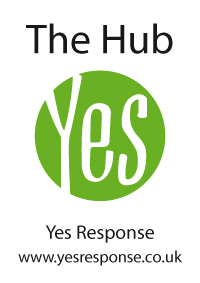 Yes Response is pleased to announce that we are relocating our operations to The Hub, Dovefields, Uttoxeter from Monday 15th October. This move is allowing us to consolidate our office and warehousing operations into one 14,000 sq. ft. property. The transition has been planned over a two week timescale to ensure that there is no disruption to projects. All of our phone numbers and other contact details will remain the same. We look forward to welcoming our clients, suppliers and friends at our new location, The Hub in the coming weeks.